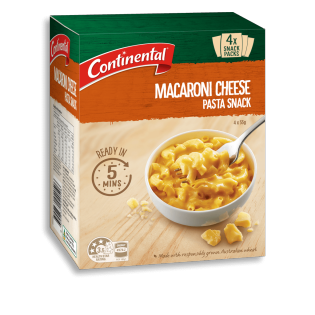 Everything you love about Macaroni Cheese Pasta & Sauce, now in a convenient snack size! With 4 serves per pack, it is completely microwaveable and ready in a matter of minutes. Now you can enjoy your favourite Pasta & Sauce any time of the day. Pasta (78%) [wheat^ flour, natural colour (carotene)], maltodextrin, corn starch, cheese powder (3.3%), salt, natural flavours (contain milk and soybean), yeast extract, mineral salts (508, 452, 451), onion powder, whey powder, skim milk powder, sunflower oil, pepper extract, natural colours (carotene, carmine). ^ From responsibly grown Australian wheat. Contains naturally occuring glutamates. This is the only Mac and cheese my son eats and I can no longer buy it. can you please, please, please bring it back? Sorry Julie, but this has been deleted from the major supermarkets. You might find them in the Reject Shop. The only positive is the portion size. Beyond this, the product had no flavor, excess liquid, a long cooking time and overall was poor compared to others. i like this product but i'm here to complain that this hasn't told me how much (g) is in each sachet. Hi, there's actually 4 sachets of 55g in each box. Feel free to give us a call at 1800 888 997 if you have any other queries.